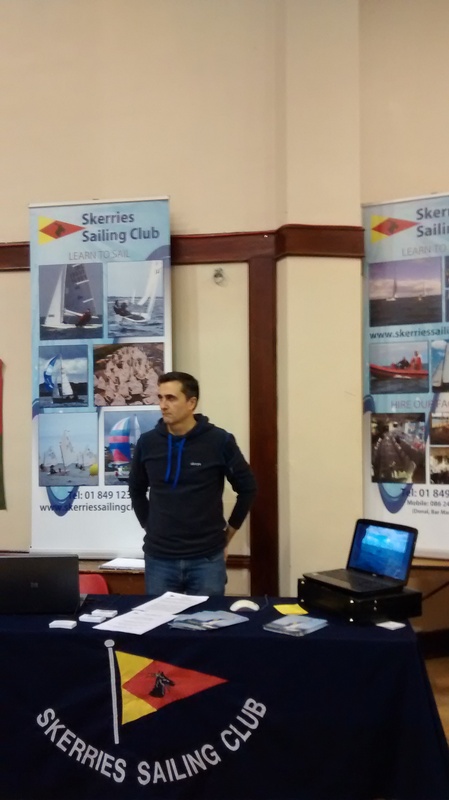 Last Saturday afternoon (November 15th) Skerries Sailing Club had a stand in the Balbriggan Community Council “Open Day for Balbriggan” held in the Balbriggan Clubs Community Centre at 23 Dublin Street, (formerly the old Balbriggan Cinema). This was an open 3 hour event to allow clubs/societies/groups present information on their activities. 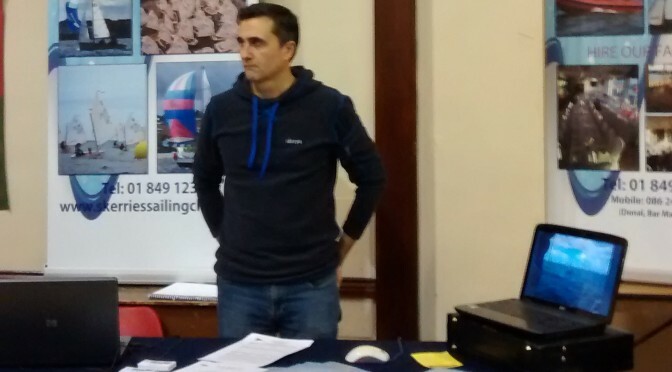 The aim of our stand, manned by Camilla McLoughlin, Brian Thornton, Paul Rogers and Kieran Branagan, was to inform attendees of the great sea amenity at their doorstep and how SSC can facilitate enjoyment of that resource by both adults and children from all over the north county. New upright posters (thanks our Commodore Tom Adams) and other material allowed for a great presentation. Interest was high and hopefully this promotion and future ones will enhance club membership in the months to come. If you have any ideas on other presentations/forums you think we could usefully attend please let us know or in fact if you have any ideas on promoting membership they will be gratefully received. Talk to any committee member. Garry Owens receiving his Volunteer of the Year 2014 award from Commodore Tom Adams. So the boats are out of the water, sails stowed, wet-gear washed and the only thing left to do was to celebrate & re-live the 2014 season. Over a 100 attended the annual Laying Up Supper. 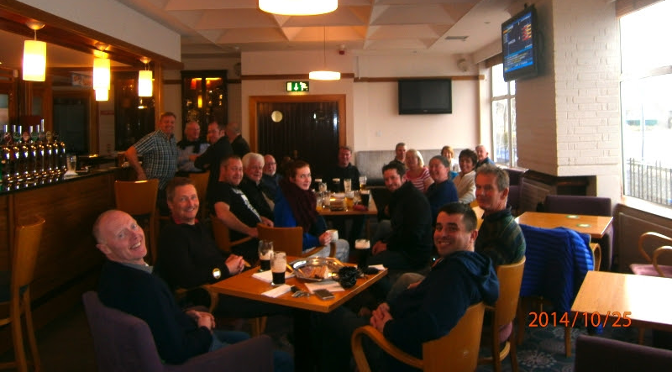 Guests came from our neighboring clubs of Malahide & Howth, unfortunately our good friends from Rush were unable to attend due to their celebrations the same night. We were also joined the Rugby Club and for the first time, representatives of the recently formed Rowing Club joined us as guests. We all enjoyed the dinner catered by Conor Mc Gloughlin. 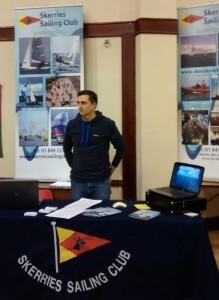 The chat lasted late into the night as we ruminated on our sailing exploits & made plans for 2015. The 79th Laying Up supper provided the usual forum for an entertaining and enjoyable prize giving evening. 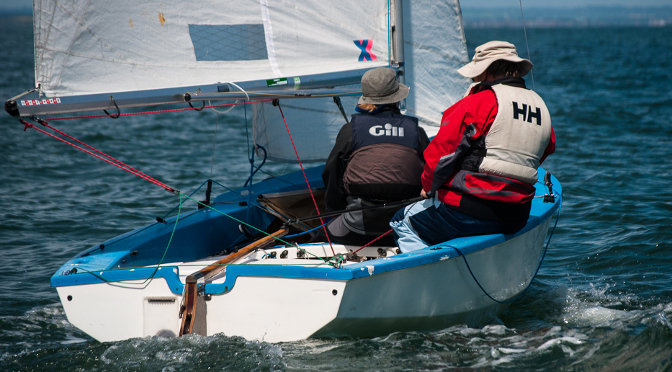 Club member racing in the summer and autumn of 2014 generated some 81 separate sailing titles including cups, trophies and series titles which were recognised at this much loved annual event. A quick review of the results demonstrates the adage the more you race the more likely you will win and those who sail most frequently win the most prizes. 26 boats and helms won prizes. Of these 18 were presented on the night. In the cruiser class Paul Hick of Easy-Go and his team did best winning the Clifton, Kevin Duff, Mariners and Holmpatrick Cups along with 7 series titles. The Sapphire prizes were not presented and will be held over for the separate cruiser supper. In the dinghy classes regular sailors Sam Shiels, Niall McGrotty, Colman Grimes and Stan Shepherd were presented with 14 trophies between them along with 15 separate series title wins. Farther and son mermaid competitors Frank and Paul Browne won the J Boylan and Dardis trophies. 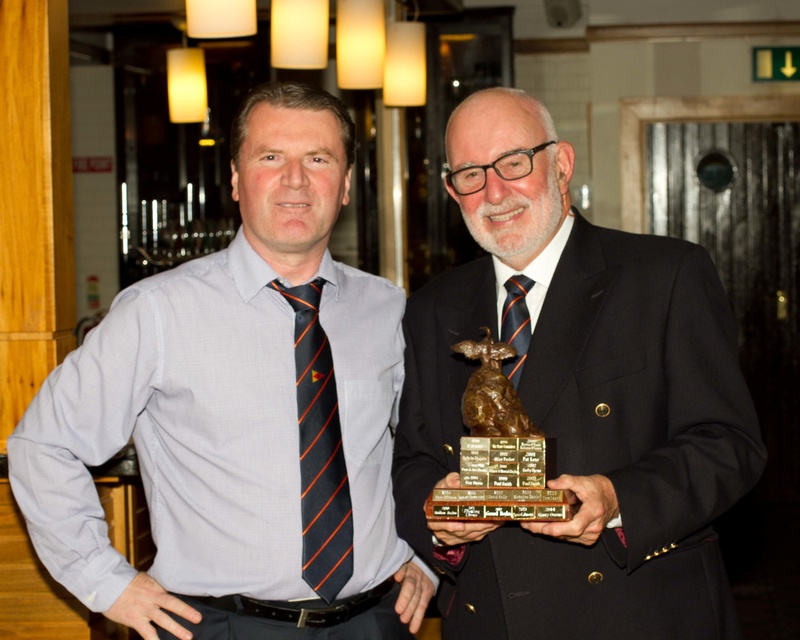 Helm of the Year was won by Colman Grimes. Congratulations also to Ross Galbraith, Alan Early, Cathal Sheridan, Noel Clarke and Don Cromer who also picked up prizes. The female sailors were well represented by the all girl crew of Easy-Go who won the Commodore’s prize, Grainne McGrotty who won the Symco trophy, and Mary Whitty winning the mermaid crews prize. Last and perhaps most important recognition of the evening was the Punch Oak Trophy for the volunteer of the year. This was won by Garry Owens for his continued work in supporting club activities in providing his well maintained committee boat for major sailing events for a number of years now, organising club talks and captaining the cruiser fleet. Thanks Garry. Special recognition was also given to the Race officers. Thanks to all volunteers through the year who help make sailing work in our club week in/week out. All welcome – Come along and join in the craic. For further information – please contact Anne Carroll 0868630554. A few hardy Skerries Laser sailors are braving the winter series at Rush. Racing in the river is,,,, interesting? fun? mad? On Sunday the tide was so strong that you couldn’t sail round the mark. A diversion a few hundred metres up tide, followed by a dive out into the current, was the solution. If you misjudge it, just rinse and repeat til you get it right. Great fun, and followed by hot soup. If you don’t come and sail, at least come and have a laugh at our discomfort. If it isn’t showing what you want to see, get in touch – you can add your own contributions. Note all the old content is still available at the ‘archive’ menu item above. We will gradually transfer all pages that are still useful. Please use the link on the left to register. Once registered, please email webmaster to be set up as an author. We need to do this to avoid ‘spam’ subscriptions. Laying up supper was a great night. Thanks Donal and all the team who organised it. More photos to follow. A great call by Liam Dinneen, PRO for Saturday, saw 7 boats brave strong winds to compete in 3 short but tough races. The tight standings before the racing added to the excitement. In the PY we congratulate Frankie Brown (mermaid 135) who defiantly, with his crew, threw off their latent tendency to become submariners and stormed through the races with a first and two seconds to win the series and the mermaid Boylan trophy with Colman Grimes and Stan Shepherd coming 2nd and 3rd in the series despite the close attention of Cathal Sheridan and Niall McGrotty. Stan wins the Dollard Cup as best laser in the series. In the progressive series Colman (GP14) took the honours from Frankie in second and Paul Browne in third (and winning the mermaid Dardis trophy). Only 2 points separated the top three boats in this competition. Following racing and the taking of boats out of the water all adjourned to the clubhouse for sandwiches kindly prepared by Kathryn Collins. Many thanks. Stuart raises money for cancer. 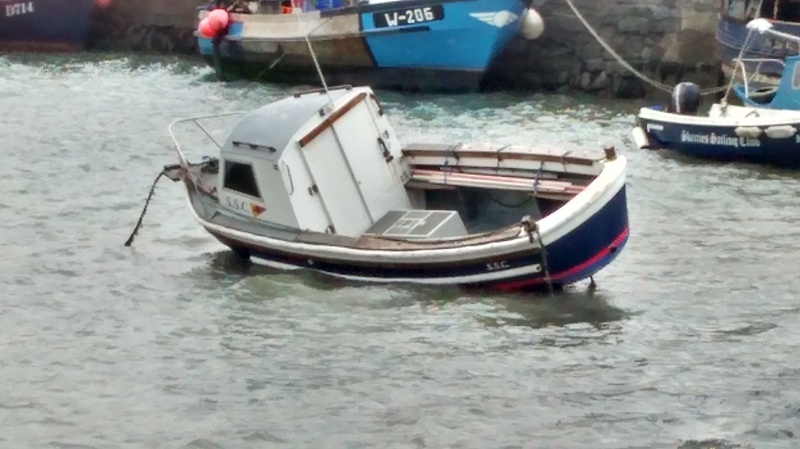 You may have seen a strange face going about Skerries over the past few weeks. 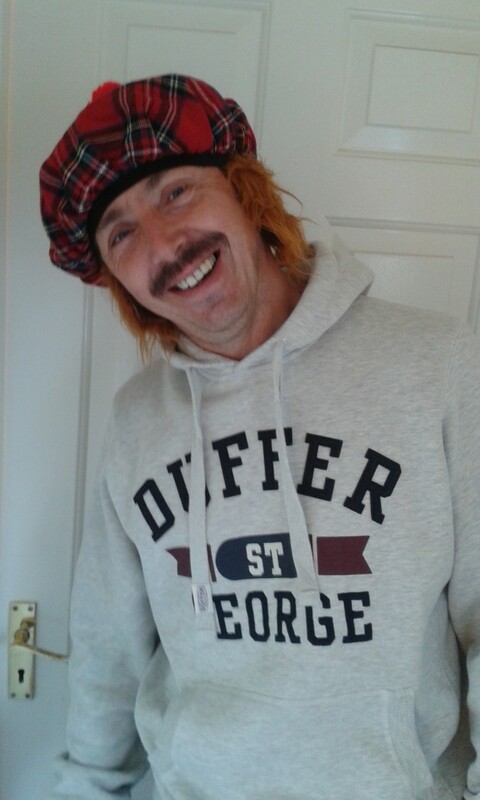 Two of Stuart’s work colleagues both early 50’s passed away this year so the remainder of the team have grown facial hair in aid of men’s health and are raising funds for cancer research. If any member wishes to donate to this cause click on the link below, or donations can be left behind the bar. If anyone wishes to donate, click on the link below or donate behind the Bar at the club.